U.S. DKNY gives you the chance to receive a discount on your entire purchase! So, take the advantage of this amazing offer and enjoy shopping. 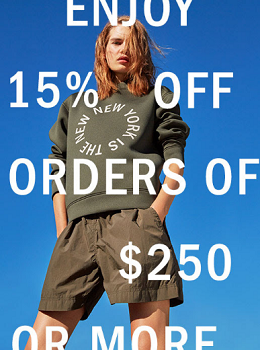 There is still some time left when you can save money at U.S. DKNY online. Take 15% off your online purchase of $250 or more. Offer is valid online only, with the promotion code SAVE15. Offer ends Wednesday, June 14, 2017. Source of the information is DKNY. For more details about the offer visit DKNY online.